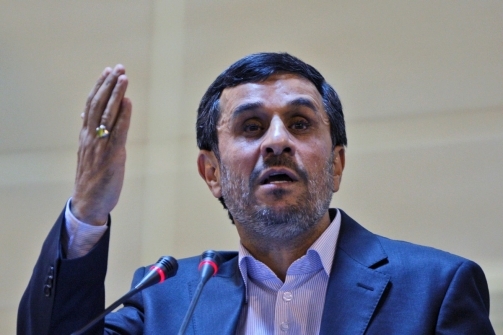 “Ahmadinejad will not tolerate an impeachment and will move to disrupt the environment,” Khazali said. “He will leak certain information, publication of which could create tension in the society." The Daily Beast- An outspoken critic of the Iranian government—and son of a conservative cleric—has accused Ahmadinejad of being linked to a banking scandal. Speaking in an interview with Voice of America, Mehdi Khazali, the son of a high-ranking conservative cleric in Iran, recently accused Iranian President Mahmoud Ahmadinejad of being directly involved in a $2.6 billion banking scam in Iran. Over the past few weeks, the scandal that has taken place inside the Iranian banking system (Mahmoud Ahmadinejad appointed the latest governor of Iran’s central bank) has turned into a tug of war among Iranian political factions. Some even believe that the scandal could push the controversial Iranian president out of office.Khazali, who is known as an outspoken government critic, appeared on a popular program called Parazit and stated that Ahmadinejad would not be able to finish his second term in office, and would be impeached and ousted by the Iranian Parliament before then. Mehdi Khazali’s father, Ayatollah Abolghassem Khazali, is a cleric in the inner circle of Iran’s Supreme Leader, as well as a staunch opponent of Iran’s reformists. Mehdi Khazali routinely attacks the cleric’s domestic and international policies in his blogs. This has led to his repeated arrests and imprisonment over the past several months.